Investors are poised to quiz drugs giant GlaxoSmithKline on Wednesday over a damaging bribery probe in China that is set to have an impact on its financial performance. The FTSE 100 company has admitted that four of its local executives may have broken Chinese corruption and bribery laws. It is accused of using more than 700 travel agents to funnel cash to doctors and other medical staff to boost sales. 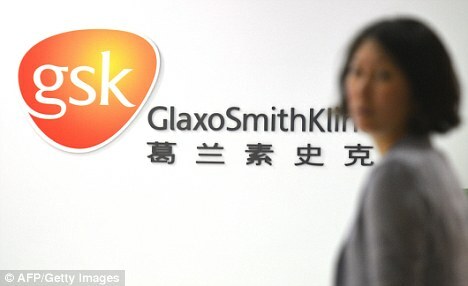 The British former head of GSK in China, Mark Reilly, recently returned to the country to assist authorities with their investigation, having left before police arrested the four senior workers. Reilly is understood to have been asked to remain in China, although he has not been detained and it is unclear whether he is banned from leaving. Before the scandal hit, GSK was making up to 4 per cent of annual sales in China, which is regarded as a key growth market. Despite the crisis, GSK is forecast to report growth in pre-tax profits to £1.8billion during the third quarter, up from £1.7billion a year earlier.